MARGARET MERRITT: Printmaker and Papermaker - Friends? The red eft, the terrestrial stage of the red-spotted newt, is a common sight in New Hampshire forests and on surrounding unpaved roads. While I love seeing these colorful salamanders, I often wonder what they think of me. This print reflects what I imagine might be the red eft's point of view. 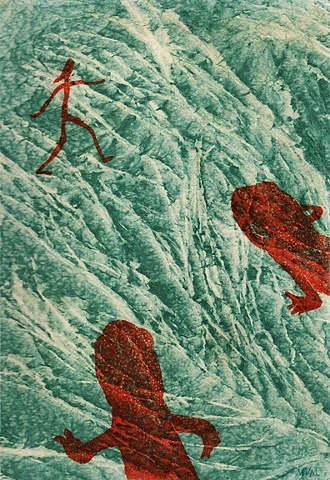 To make this artwork, I printed solar plate etchings on patterned kozo paper that I made specially for this series of prints of humans from the red eft's perspective.